Geek Grotto - Get Your Geek On! : Guided Fate Paradox Is Now Available In North America! Guided Fate Paradox Is Now Available In North America! Well, a review is coming for this, once I finish Disgaea D2. So little time available, yet NIS loves giving you games that can easily span 100+ hours! How can one fit 40+ hours in day to play NIS goodness? Seriously, I need to know! 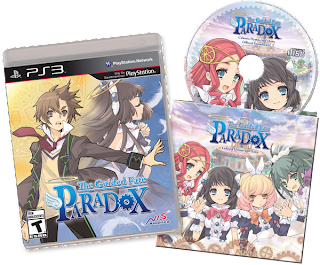 Santa Ana, Calif. (November 5, 2013)– NIS America is proud to announce that The Guided Fate Paradox™ is now available for purchase across North America in both retail form and on PSN. Created by the same development team as Disgaea®: Hour of Darkness, The Guided Fate Paradox is the spiritual successor to Z.H.P. Unlosing Ranger vs. Darkdeath Evilman–an extremely approachable and story- driven roguelike RPG. The Guided Fate Paradox continues in the same vein with a fresh and unique approach toward the roguelike genre, with a memorable cast of characters, a compelling story, tons of customization, and almost infinite replayability. Players take on the role of high school student Renya Kagurazakawho has become a god by winning a lottery in a mall! Renya must travel through the Copy World in order to affect changes in the Original World and make people’s wishes come true. But is there some other force at work? • In-depth customization featuring off-the-wall armor, weapons, and more. Want tank treads for legs? Or maybe a fish head instead? Well, there you go! • 3D randomly generated dungeons offer floor after floor of surprises! Don’t be afraid to die—you’re God! The levels you gain while dungeon-delving will help boost your stats! • Hi-resolution 3D sprites offer sublime visuals while you ogre through the game’s ethereal dungeons! You won’t be alone though—angels are by your side! • Disgaea-inspired, over-the-top special attacks allow you to crush your enemies with creativity drizzled with a slight hint of levity!